Finally – we are opening registrations for our 2nd Handstand Factory – Push Harder retreat! 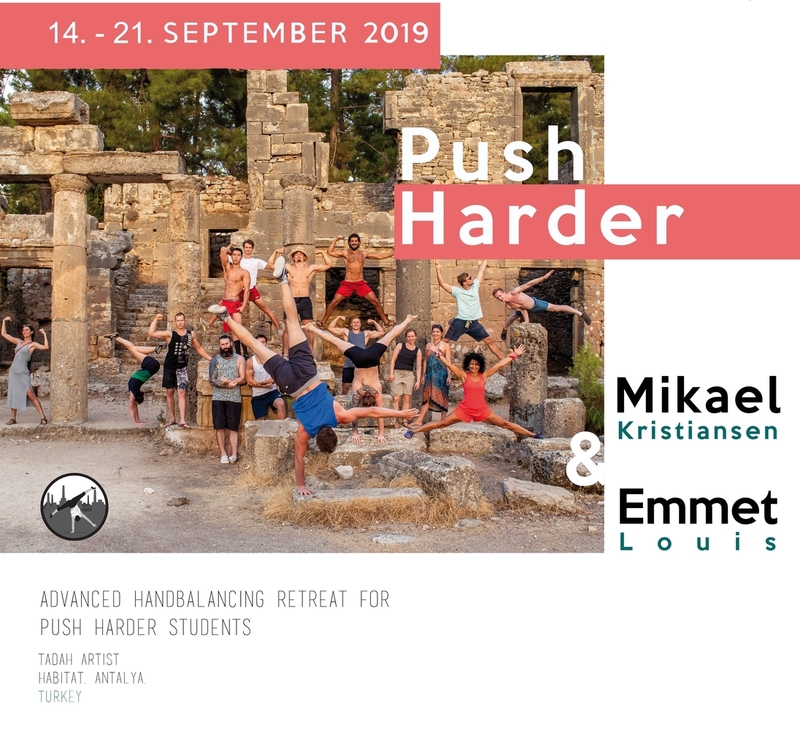 It’s a 7 day advanced handbalancing and flexibility retreat in Turkey with Mikael Kristiansen and Emmet Louis, based on and open for students of the Push Harder online course. It will be taking place from the 14th to the 21st of September 2019. Since the launch of the program, we have been overwhelmed with the positive response from you guys, and the progress already made. To deepen your practice, meet your fellow Handstand Factory students (and us) in person, and spending a week immersed in full training, we are excited to invite you to the Push Harder retreat in Tadah Artist Habitat, Antalya. In line with the Push Harder programs level, the focus of the retreat will be on advanced practitioners in their handbalance training. The week will be centred around training for, achieving, or progressing your straddle one arm handstand. If you have a solid straddle one arm, there will be time and space to work on progressing to other one arm forms, and switching smoothly between them. Along with the handbalance training, we will be spending a lot of time on learning about flexibility to aid you in your handbalancing practice. This retreat is open to students of the Handstand Factory – Push Harder program! If you have used the program for a minimum of four weeks, and feel like it is appropriate to your level, come join us! Haven’t started the program yet?